That’s how Grade 11 student Aiden Douglas says he’s feeling as he prepares to show his respect to local veterans this weekend. 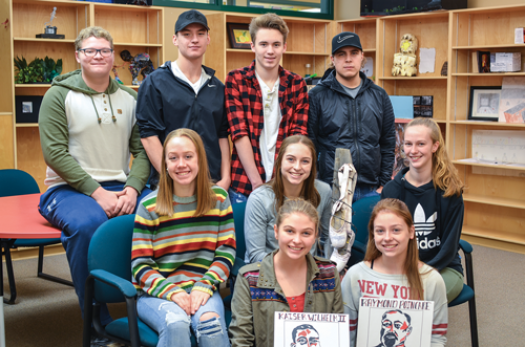 Aiden is one of 10 students from Crowsnest Consolidated High School who have prepared special projects that they will present for guests at the armistice anniversary and veterans gala this Saturday in Crowsnest Pass. Aiden’s project will use food to tell the story of the First World War. Students who prepare a project for this event will get school credits through the Alberta Education special projects program, but Aiden says it’s about more than improving his transcript. Senior Maeve Rothlin says she wants to make sure she doesn’t disappoint with her project either. She’s working on four watercolour portraits of Coleman veterans, which will be hung at the gala. “It’s hard because you can make one line and all of a sudden they can look very sad, and I want them to have more of an innocence and dignity, and look mournful rather than afraid,” Maeve says. Luckily, Maeve has some good help — her mother is local artist Kari Lehr. 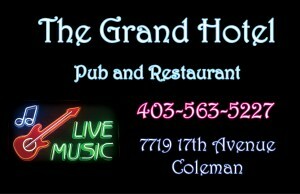 Grade 12 students Aden Janson, Lewis Rogers and Ethan Wall will perform a special rendition of Bruce Springsteen’s “Death To My Hometown,” where the lyrics have been tweaked to acknowledge the history of the 192nd Battalion of Crowsnest Pass. Ashley Enefer, Grade 12, will read some local primary source documents — letters and scripts by southern Albertans who served and loved those who served. And three dancers from Turning Pointe Dance Studio — Tori Wakaluk, Grade 12; Alice Murray, Grade 11; and Elena Tkachuk, Grade 11 — will perform an interpretive piece that they have choreographed themselves about a soldier’s loss of innocence on the front line. Alice Murray says she appreciates the opportunity to use her passion to honour something important. Debby Greenwood, treasurer and secretary of the Coleman Legion, says gala organizers are thrilled with the students’ creativity, and hopes their projects will help maintain the legacy of Nov. 11. “They’ve gone above and beyond what we asked them to do — and that’s the generation we need to hit with the importance of the message of Remembrance Day,” she says. The students say working with local veterans has already made an impression on them. “They’ve kind of guided us through the whole thing,” says Alice Murray. “A lot of them have expressed how important and thoughtful they feel this is, and I think that really helps us want to do it more,” adds Aiden Douglas. The students will test-run their projects at their school remembrance service on Nov. 9, which is open to the public, for those community members unable to get tickets to the gala. The service will start at 9 a.m. in the CCHS gym.